It's that time of year when people are harvesting their gardens, making final preparations for their fair entries, and trying to get that final camping trip in. Fall is in the air for sure. I took the weekend to not worry about watering pots and spent the entire day in my sewing studio. I had a blast working on “Broomhilda’s Bakery” quilt blocks! 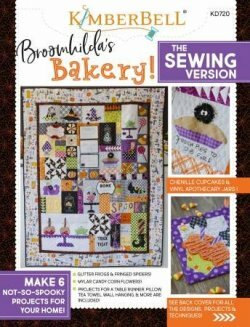 Broomhilda’s Bakery is Kimberbells’ yummy Halloween quilt featuring the cutest “treats” ever. We will be starting a Block-Of-The-Week beginning on September 11 and finishing up just in time on October 16. September is NATIONAL SEWING MONTH and we invite all of you to show us what you are working on! There are several ways to share with us: 1) Bring your project or a photo into the shop. 2) Email us a photo (sew@PatchworkQuiltsHamilton.com). Or 3) Post a photo on our Facebook page. You must allow us to share it with our customers. When you do, your name will be entered into a Drawing to Win a Twin Size package of Warm & Natural batting. Have you seen the newest item in home decor? 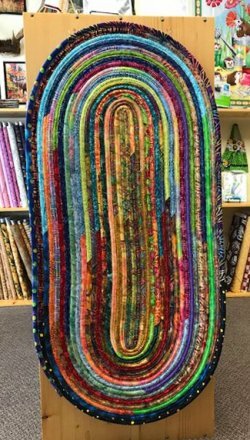 It is Jelly Roll Rugs and they are fabulous! Marilyn will be teaching this technique on Saturday, September 22. We only have a couple of spots available for this class so sign up today! This is such a great way to use up your scraps of batting and fabric. All of us at Patches are wishing you a fun Labor Day weekend! Enjoy the fair too and look for our banner in the Quilt Department, as we are again proudly sponsoring it.